Britain's Bradley Wiggins comfortably retained his lead of the Tour de France as Thomas Voeckler won stage 10. Team Sky worked hard to catch Italy's Vincenzo Nibali after he escaped on the descent of Col du Grand Colombier, the first big climb of this year's Tour. Wiggins still leads 2011 winner Cadel Evans by one minute and 53 seconds, with compatriot Chris Froome third and Nibali staying in fourth place overall. 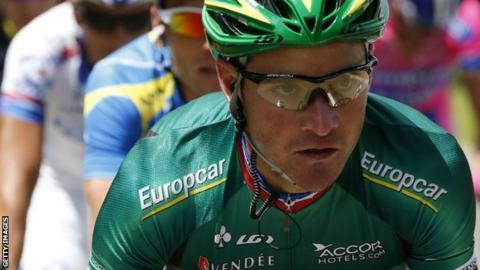 Frenchman Voeckler won the stage ahead of Michele Scarponi and Jens Voigt. Voeckler, who wore the yellow jersey for 10 days last year, was part of a 25-man breakaway that was whittled down to five riders by the end of the 194km stage. "Team Sky did everything perfectly. Their only problem was losing Michael Rogers with a mechanical on the descent of Colombier, but that didn't prove to be detrimental. One of the key things was that they managed to control all the attacks without having to use Chris Froome at all, although I wasn't surprised that Cadel Evans didn't try anything on the big climb because I don't think he is capable of attacking Wiggins." The 17.4km climb to the 1,501m-high summit of the Colombier was expected to shake up the top of the general classification but, with Edvald Boasson Hagen and Richie Porte working hard, Team Sky set a fierce pace at the front of the peloton to negate any potential attacks. Their biggest threat came from Nibali, who lost the yellow jersey group as they came down from the summit and at one point opened up a gap of close to a minute. Nibali started the day two minutes and 23 seconds behind Wiggins but threatened to move ahead of Froome, who held a 16-second advantage. Porte ensured Nibali was caught before he reached the top of Col de Richemond, and he could not escape again on the descent to the finish line. Defending champion Evans attempted to claw back some seconds in the finale but Wiggins was alert and stuck to the Australian's wheel to roll in one place behind him in 13th. Afterwards, the 32-year-old Londoner was pleased with his team's efforts, explaining they were willing to sacrifice yellow in order to stay near to his closest rivals. "We talk over the phone when I am not with him and the team during the Tour but there is no need to say a lot. He is in control of all of his emotions and my belief is that he is untouchable at the moment." "We were prepared to lose the jersey today if needs be to Scarponi who was the best up there in the breakaway," Wiggins said. "It's about wearing it in Paris, not for three weeks. "I was waiting for Nibali to play his joker card but fortunately he went solo and we knew that he wouldn't have the legs. It was a bit desperate really. "You do have to gamble a bit and let some people go, you can't chase everything that moves. But we rode hard on the next climb to get it back and it all worked out. " On Thursday, Wiggins will become the first Briton to wear the maillot jaune for four days in one Tour, beating the previous best of three days set by Chris Boardman in 1994 and David Millar in 2000. But he can expect his rivals to launch more attacks as the race stays in the Alps, with a mountain-top finish at La Toussuire after going over the top of two huge climbs, Col de la Madeleine and Col de la Croix de Fer, which are both over 2,000m. 2. Michele Scarponi (Ita/Lampre) +3"
3. Jens Voigt (Ger/RadioShack) +7"
4. Luis Leon Sanchez (Spa/Rabobank) +23"
5. Dries Devenyns (Bel/Omega Pharma-Quick-Step) +30"
1. Bradley Wiggins (Britain/Team Sky) 43:59:02"
2. Cadel Evans (Australia/BMC Racing) +1:53"
3. Chris Froome (Britain/Team Sky) +2:07"
4. Vincenzo Nibali (Italy/Liquigas) +2:23"
5. Denis Menchov (Russia/Katusha) +3:02"